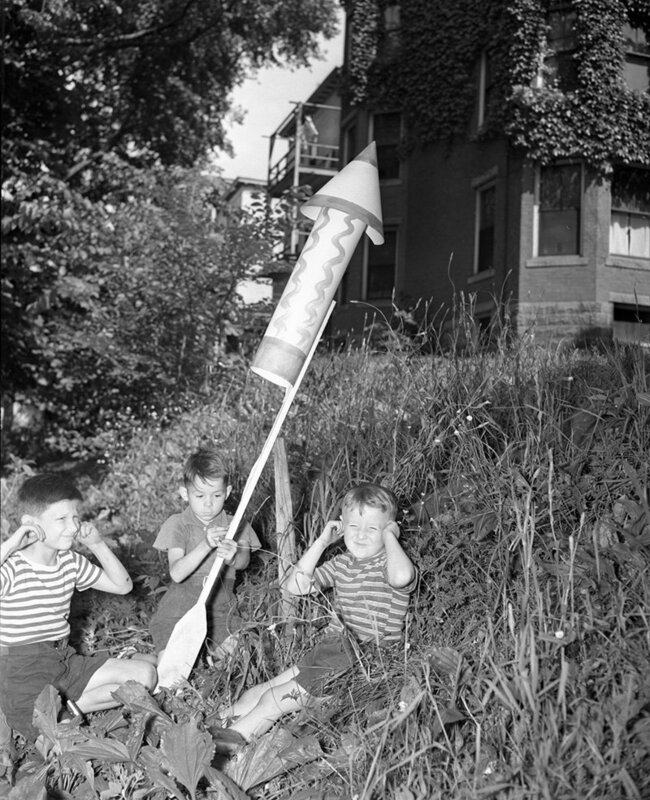 Richard Corbett, 8, of 6 Grant Street, center, shows little trepidation as he prepares to touch off the grand-daddy of all rockets, but his friends Norman Bombary, 6, of 25 Grant St., left, and Robert Meserve, 5, of 9 Carlton St. display considerable alarm. The boys were holding a holiday celebration in 1939. 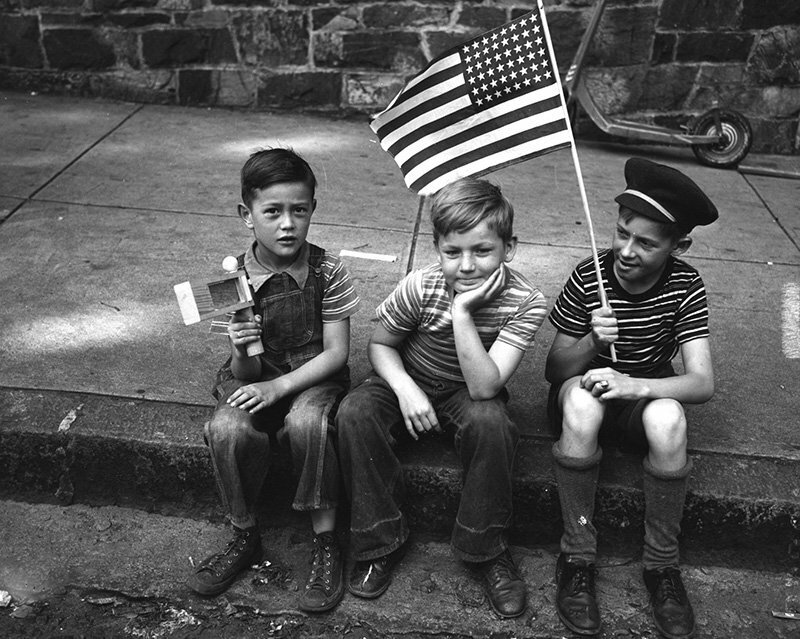 Unhappy of heart is Paul Shea, center, as he ponders a Fourth of July without firecrackers. His companions James Ball, left, and Norman Lapierrre appear to have solved their problem of what to do on the holiday. Jimmy will whirl his wooden noisemaker, similar to those used by air raid wardens, while Norman will do a lot of flag waving. Maine Gov. Sumner Sewall prohibited fireworks by executive order in 1942 and this was the first year that fireworks were restricted to public displays. 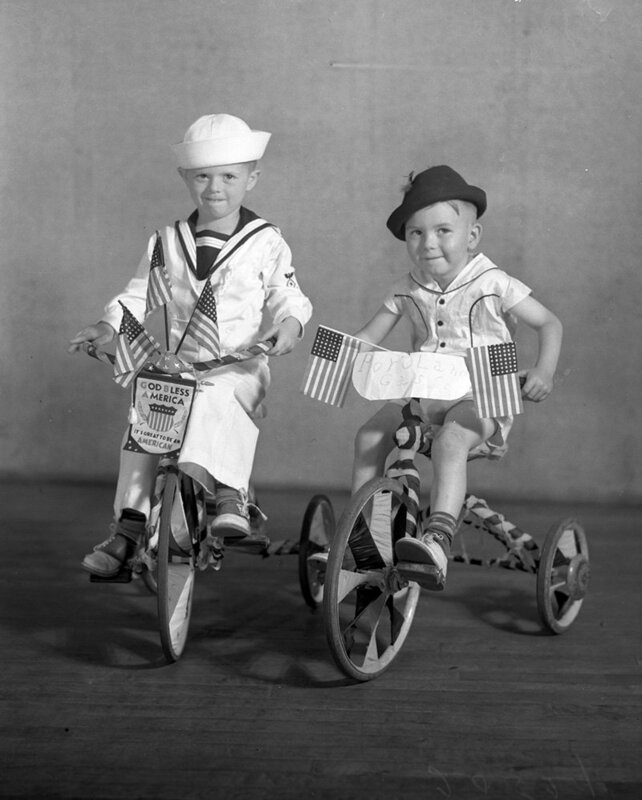 Jackie G. Quinn, left, and Edwin J. Huntoon, both of Douglass Street, entered the doll carriage and tricycle parade in connection with the lawn party at St. Joseph’s Church in 1940. 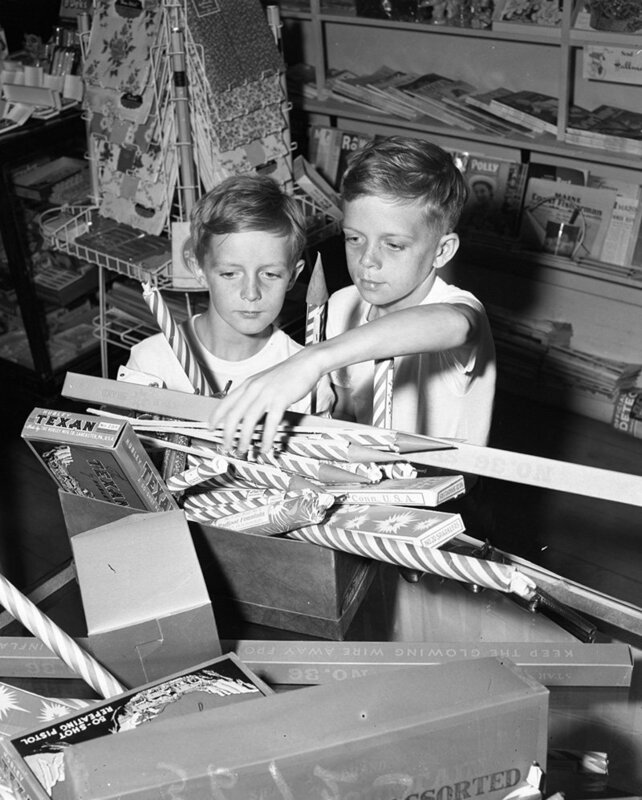 Johnny Hunt, 11, left, and his 13-year-old brother Jimmy, shopping at a South Portland store, plan an explosive finish to their 1949 celebrations with fireworks. 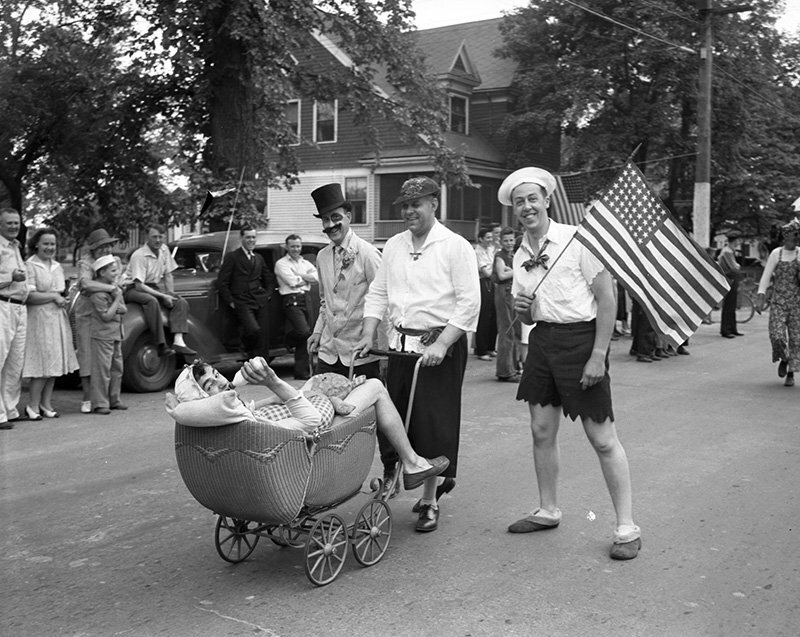 William H. Anderson, Jr., the contented baby, Charles W. Stanton, Ralph D. Latham and Philip R. Yerxa are businessmen when they are not in the Horribles Parade on July 4, 1941 in South Portland. OHHHHHHH, BE CAREFUL! 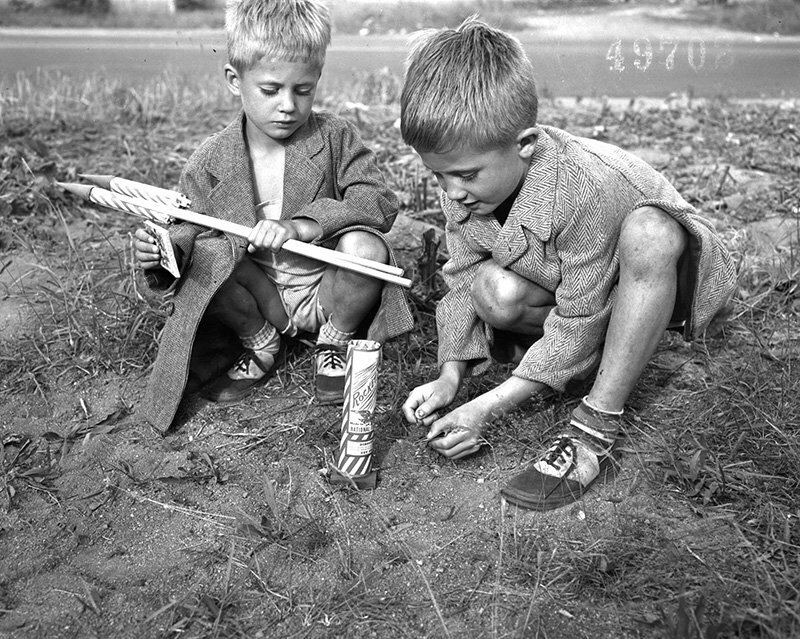 - Jane Michael Donovan, 7, warns her playmate Forrest Boss, 9, as he starts to light a Fourth of July firecracker in 1949. He probably will be careful, too. A firecracker, tossed by an unidentified youth, exploded near Forrest’s face a few days ago. Next year they won’t have to worry for this type of fireworks will be banned in Maine. 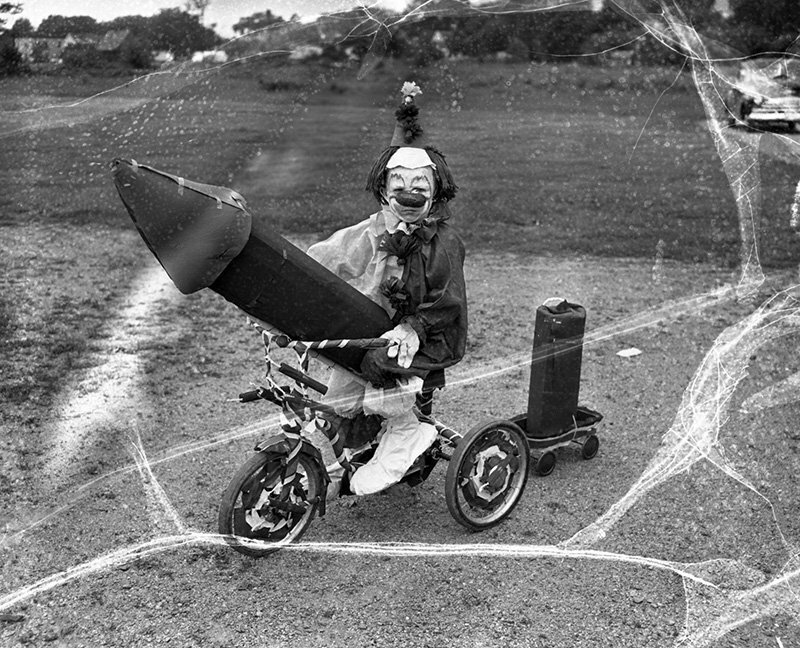 Bozo on Skyrocket: First prize in the 1951 Horribles Parade of South Portland Post, VFW, in Pleasantdale on the Fourth of July was won by Larry Shibles, 4. 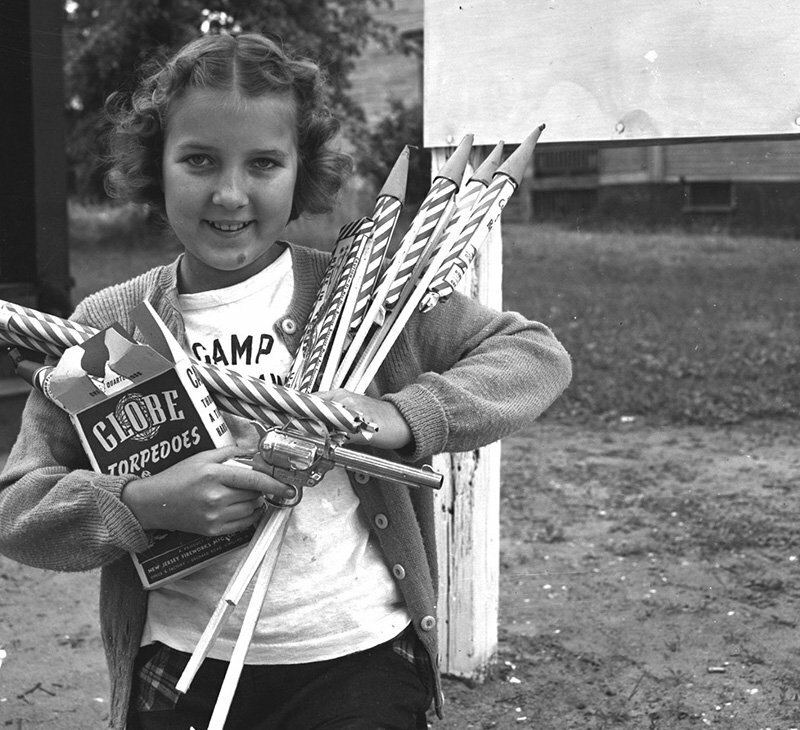 The field day was one of several special holiday programs held in Maine. 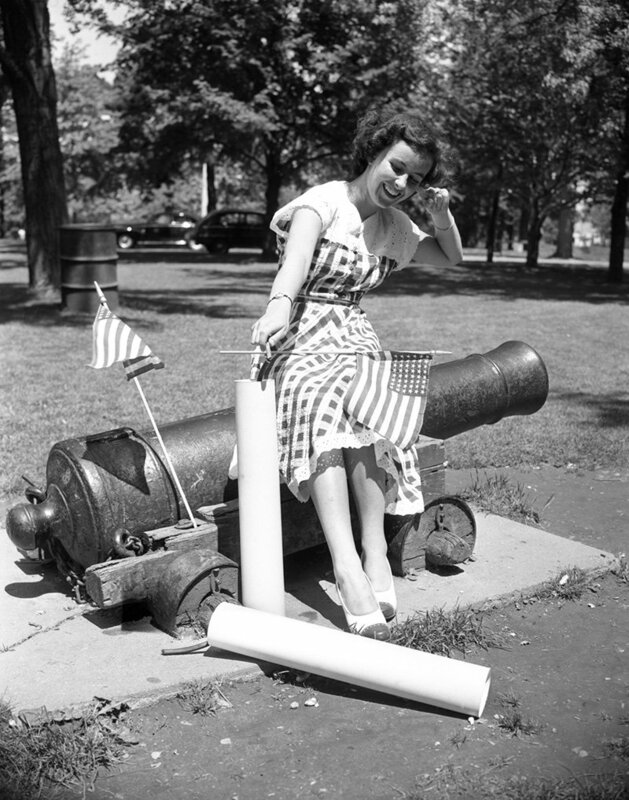 Ready for a big Fourth in 1948 - Dorothy Moran of South Portland sits on a small cannon at Deering Oaks as she uses one hand to light a king-size firecracker and the other to plug her ears. The giant firecrackers are just photographers’ props, kids, because it’s illegal to discharge fireworks in the city limits. But it’s a sure bet Dotty’s rehearsal technique will be duplicated with the real thing for a noisy Fourth elsewhere. 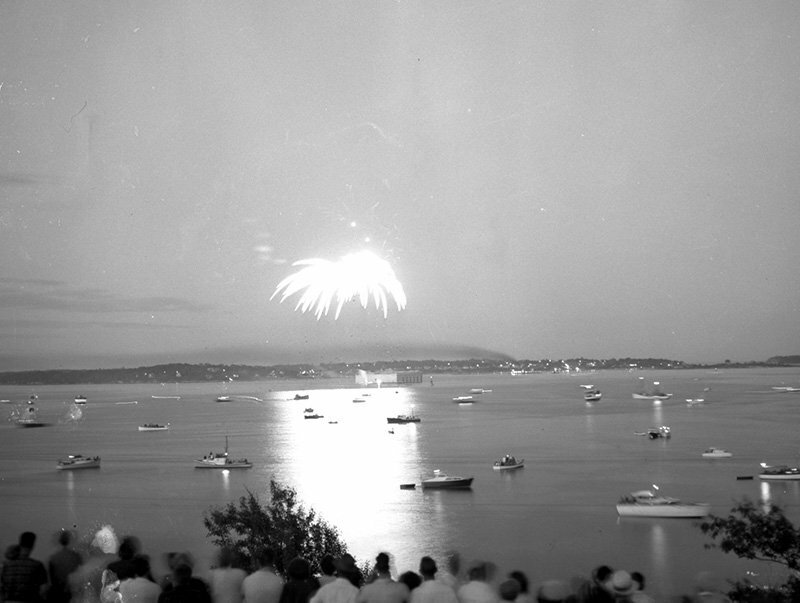 Fireworks shot off from Fort Gorges seen from the Eastern Promenade in 1956. 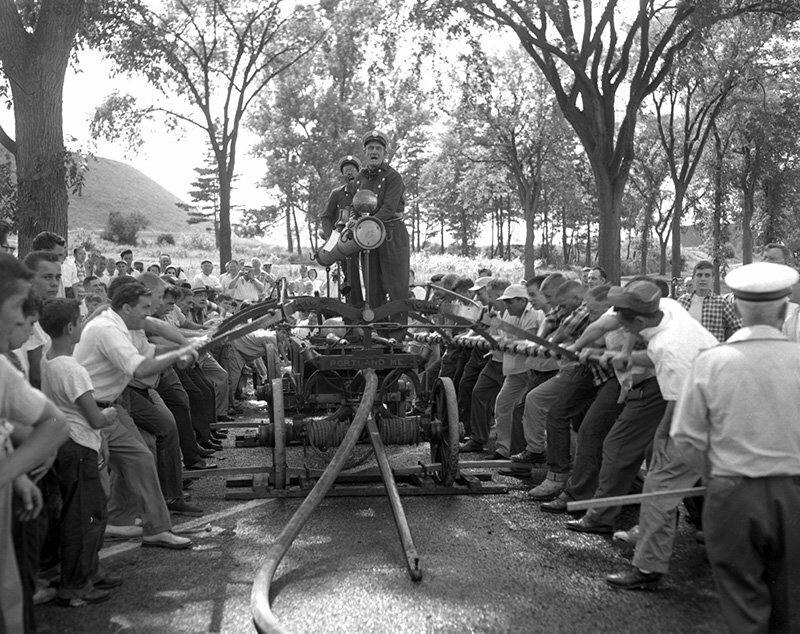 Straining volunteers pump the long handles of the Forest City, Portland’s handtub, at a veteran firemen’s muster in 1957 on the Eastern Promenade. Onlookers cried “Brake ‘er down, brake ‘er down," the traditional cry to urge the men to bear down on the brakes, or handles. It was the first muster held in Portland in 22 years. 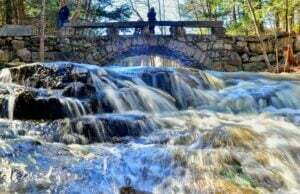 The muster was won by Rockland’s General Berry that produced a stream of water that went 209 feet, 5 3/4 inches. Although the Forest City failed to place in the contest, the Portland Veteran Firemen’s Association expressed satisfaction in her performance. 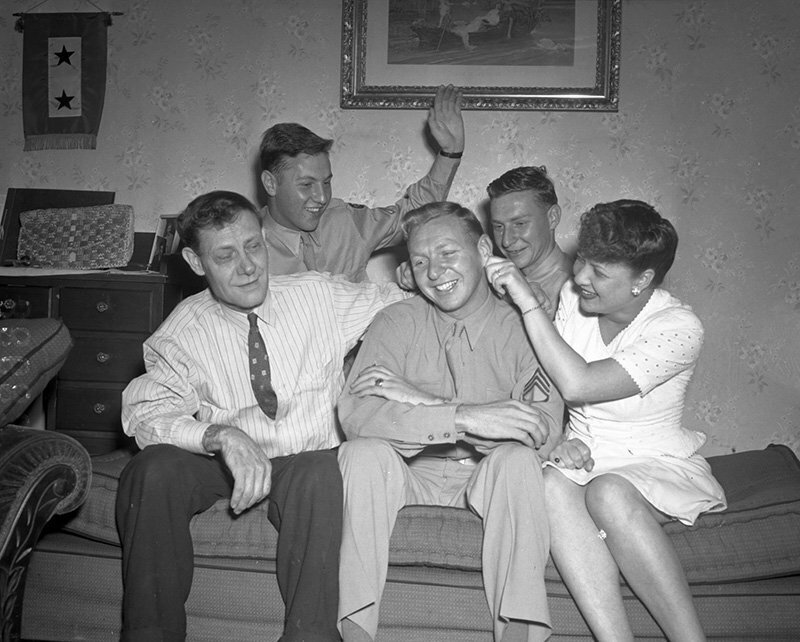 Home all together for the first time in four years, three of Frank W. Koelenbeek’s four sons in the service celebrate the Fourth and the birthday of one of them with a July 3rd party in 1944. Front left to right is Frank W. Koelenbeek, S/Sgt. Joseph Koelenbeek, who is 25 years old today, and Mrs. Esther LeClaire, sister of the Koelenbeeks. In the back row, Pfc. Daniel and Pfc. Ted Koelenbeek. 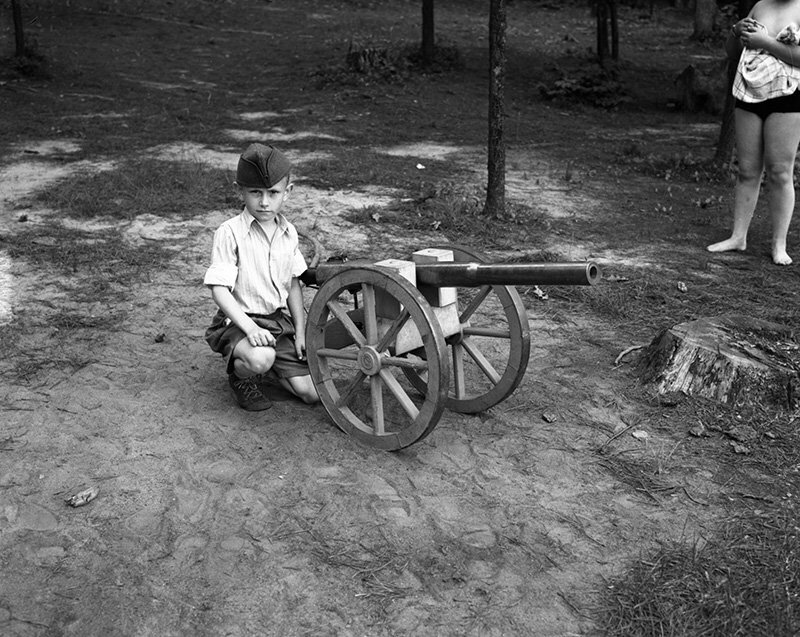 Crestfallen Donald R. Goodwin of South Portland, kneels beside the Salute gun in 1942 at Camp Hinds, Panther Pond, whose booming bark was silenced by Gov. Sumner Sewall’s “no noise" edict. 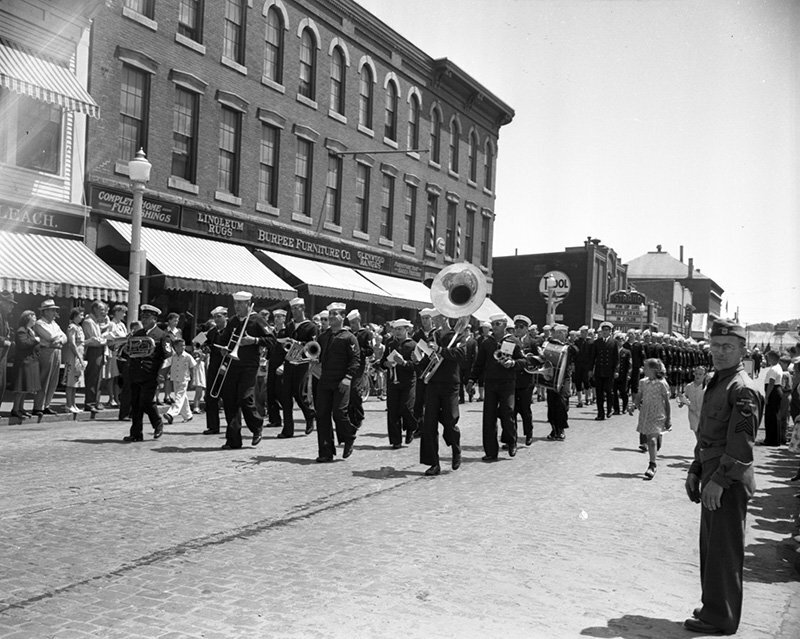 1944 Fourth of July parade with sailors and a band in Rockland. 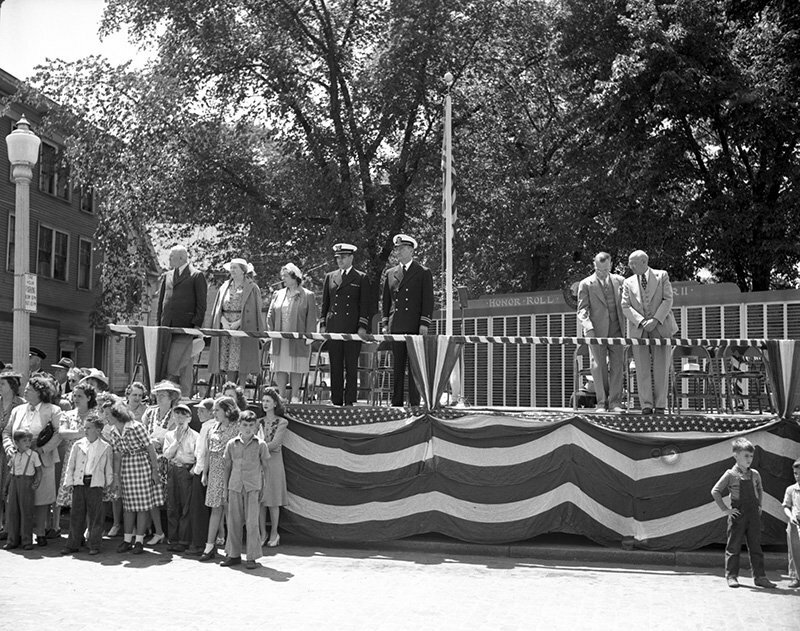 1944 Fourth of July reviewing stand in Rockland. 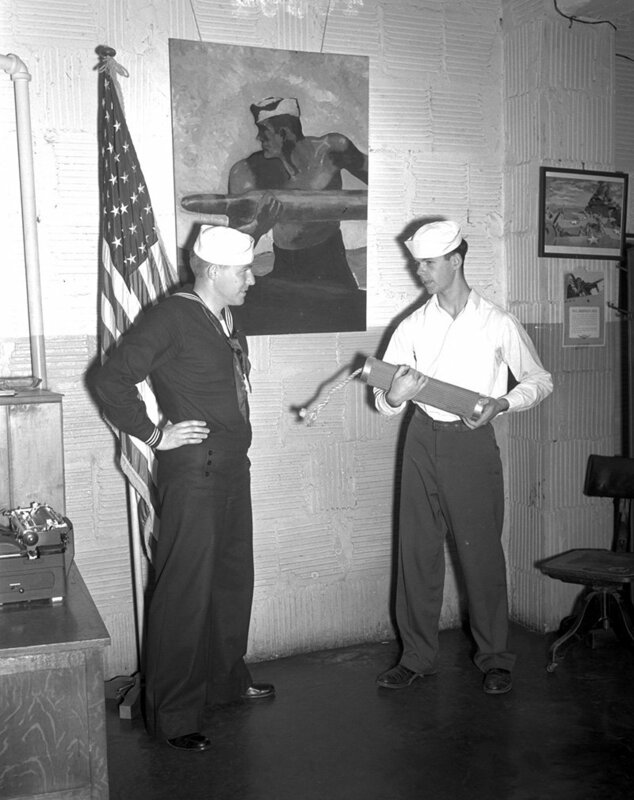 Leonard R. Boyle, right, son of Mrs. Ellen J. Boyle of Portland, will need the large firecracker he is holding to celebrate his Fourth in 1945. It is his 18th birthday and he has enlisted in the Navy. 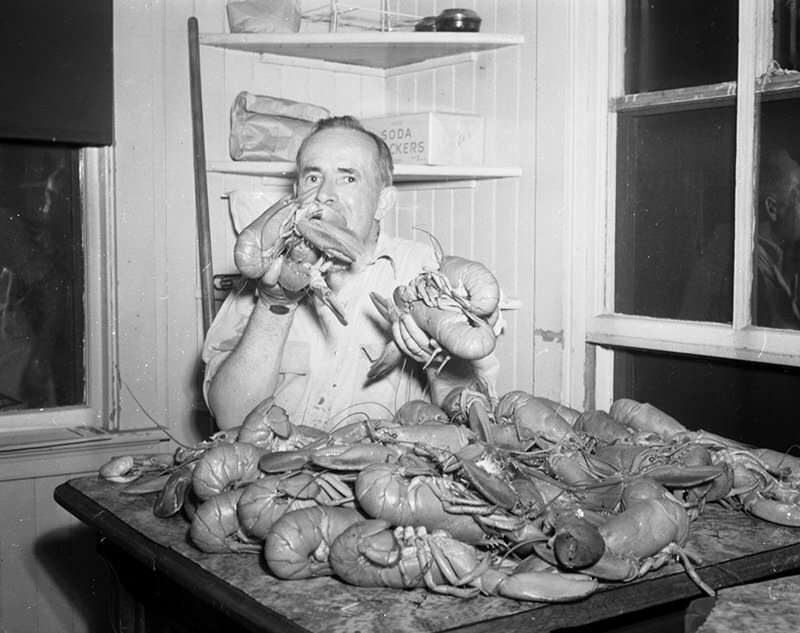 Philip S. Campbell, USNR of the Navy Recruiting Station, looks on.  Boyle was graduated from Cheverus High School last month. His father, the late Leonard J. Boyle, was master sergeant in an infantry division in World War I. 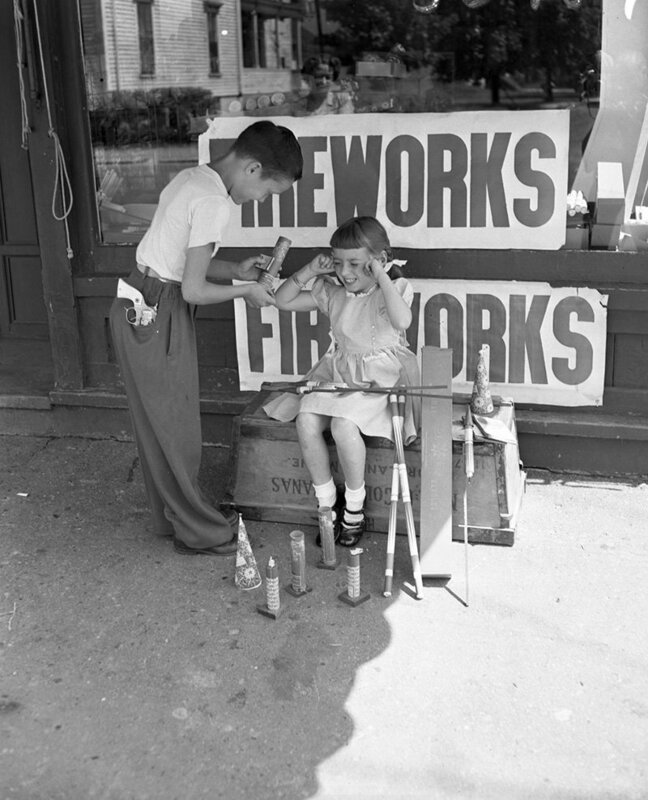 The fireworks rush was on in South Portland in 1949 as youngsters stocked up with plenty of noisemakers to celebrate their last old-fashioned Fourth of July for some time. 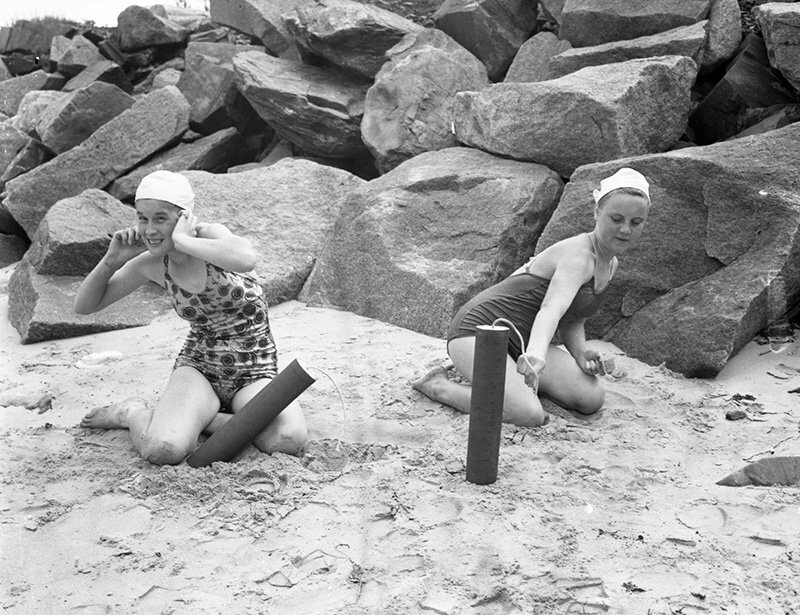 Diane Buchman, 11, her arms filled with skyrockets and roman candles, was ready to celebrate her first and last noisy holiday. Diane moved this year to the Cape City from her native Florida where fireworks have been banned since her birth. She just got in under the wire, since fireworks will be taboo in Maine next year by state law. 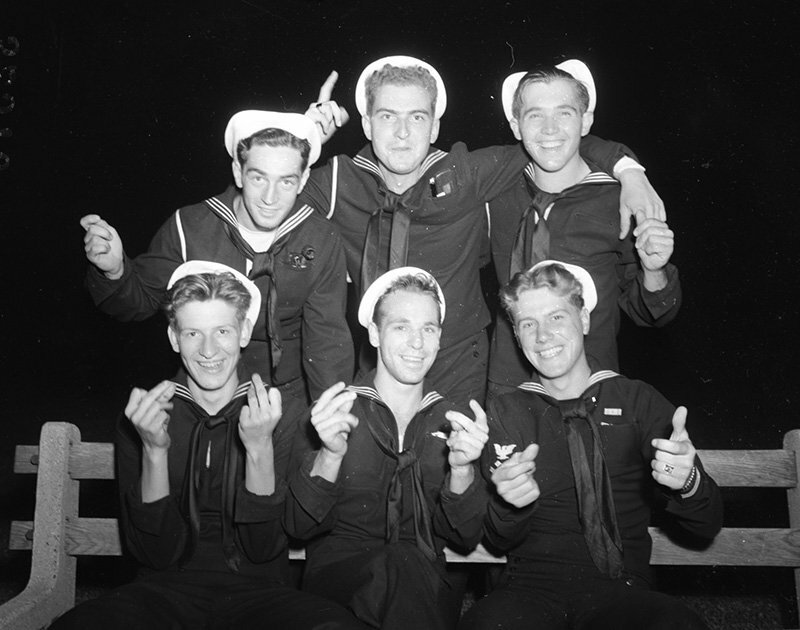 In 1942, Uncle Sam’s fighting men of the sea lucky enough to get shore leave in Portland on the eve of the holiday needed no firecrackers for their celebration. Those snapping fingers tell they’re on their way to cut a rug in some local dance hall. 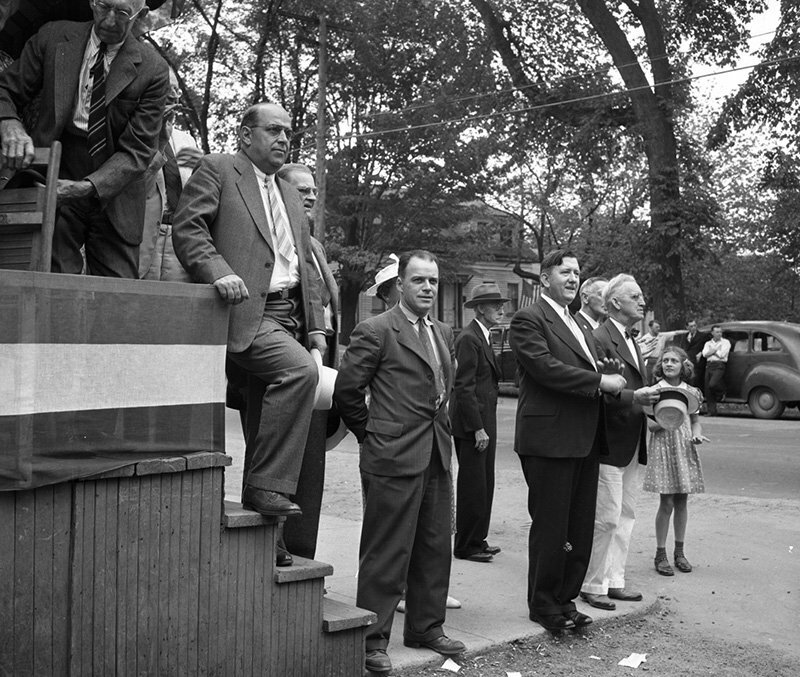 Members of the South Portland city government on the reviewing stand in 1941 were Councillor John H. Mann, City Manager Harry A. Brinkerhoff and Councillor Gerald E. Lord. The Rev. Lawrence D. Porter, pastor of the Elm Street Methodist Church, sponsors of the Fourth of July parade, stands in the foreground. 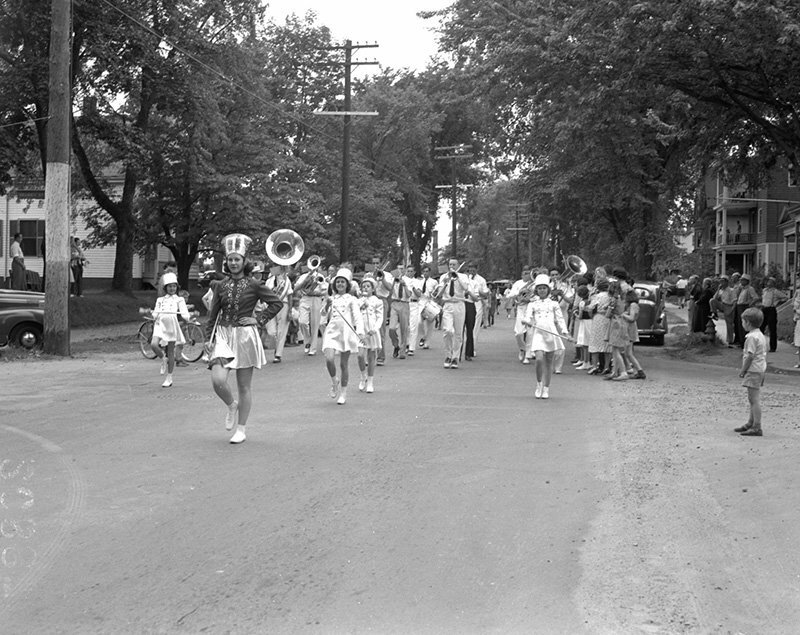 Four drum majorettes lead the 30-piece band in the South Portland parade in 1941. 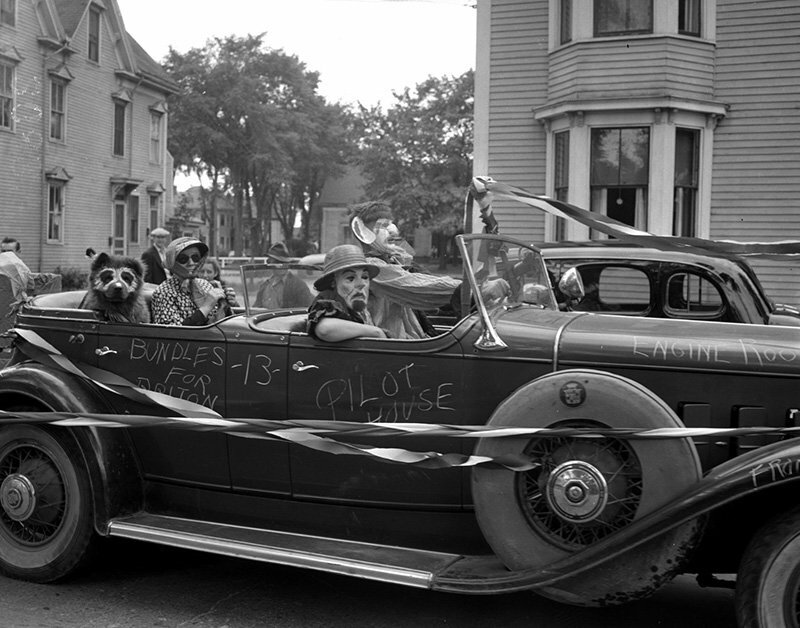 Neither man nor beast is spared in the 1941 Horribles Parade in South Portland on July 4th. 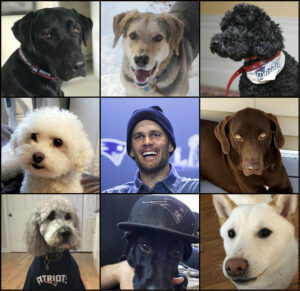 In the top left, even the family pup looks like a refugee from a surrealist’s nightmare. It is 1941 and in this modern manner will these two Portland lassies and citizens throughout the Nation today observe the 165th anniversary of the signing of the Declaration of Independence. Trying to soften the noise of the big cracker’s explosion is Dorothy Sawyer of 46 Turn St. while Rolene Paine of 50 Quebec St. grimly sets about lighting the second cracker. 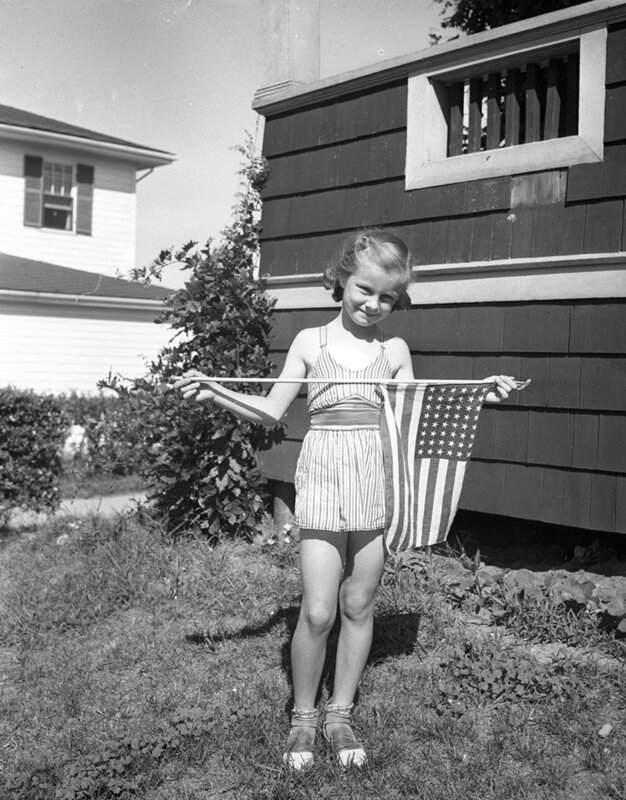 Dorcas Ann Frost prepares for the Fourth of July in 1941.